During the year 2006-2011 in my home country, digital cameras are ubiquitous. Nowadays in various parts of the world, digital single-lens reflex cameras dominate the scene. If you have either one of those and use it for fun or passion, you could call yourself an amateur photographer. It was in 2012 when I became a full-time amateur photographer—when the blog officially turned into a travel blog. When I fell in love with sharing the experiences and photos from climbing mountains and, soon, travels. And after a few years of being a shutterbug, I only acquired one of the many essential photography skills (but still, a work in progress): composition skill. Truth be told, I still rely on the available automatic settings of my shooting equipment. This equates to doing trial and error technique—taking innumerable photographs and come up with just a thing or two for sharing. After all those years, I have learned that there is a slow progression of technical knowledge in photography without the formal education requisites. This holds true for my case obviously. I still have good reasons to be proud of the little achievements from just being an enthusiastic photographer nonetheless. Thank heavens social networking sites and hashtags exist on the web. It was them that paved the way for my photos to be noticed. I am referring to the 15 photos on my Facebook and Instagram that made it to It’s More Fun in Bicol, Bicol Bloggers, and Philippine Images’ FB pages and IG accounts respectively this year. These photos showcase some of the best tourists destinations in the Philippines. In May 2016, I also got an opportunity to be interviewed by the Sr. Copywriter, Soffian Manaf, of Photobook Worldwide as as part of its endeavor to partner with different personalities around the world to take a peek at how their passion translates into a work of art. 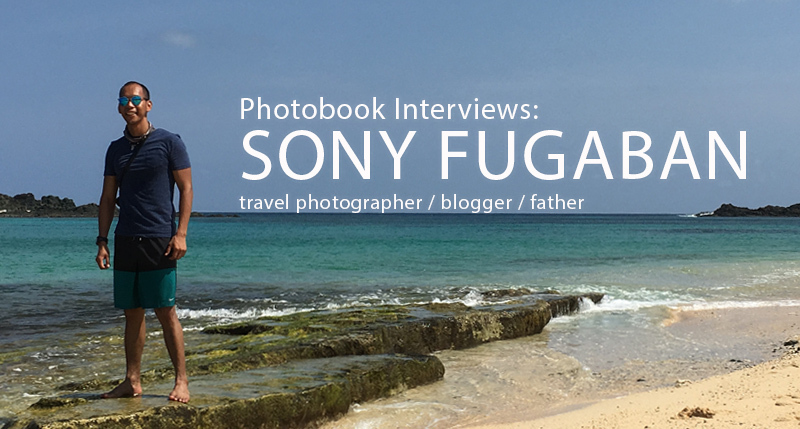 I was fortunate to be their 13th artist for this collaborative work: “Photobook Interviews: Sony Fugaban“. Photobook Worldwide is the leading maker of premium handmade photo books that let you cherish your best memories into gorgeous coffee-table books. They currently serve more than 100 countries worldwide, and has 4 global offices located in Australia, Canada, Malaysia, and the Philippines. And, the blog post titled “A Tour to the World Sights Park in Riyadh, Saudi Arabia” that was featured on “Life in Saudi Arabia” and its social networking sites. This was actually a story of non-credited post which I discovered by chance. I called the attention of the blog’s administrator right away. I got the credit for the post and photos eventually. In all fairness, the administrator was very apologetic and submissive when we were exchanging emails and comments. I would have been a lot happier though if I was given due credit the proper way (i.e., citing my complete name and the blog’s as opposed to “Souce: Yobynos”). “Life in Saudi Arabia” is dedicated to giving readers the complete guide (Climate, Living, Birth, Procedures and much more) to living in KSA. It now has over a million followers, collectively. Without the help of these Facebook pages, Instagram accounts, and websites, I would have not noticed the improvement in my composition skill. They have significantly boosted not only my photos’ likes and blog’s traffic but my confidence as well. According to business.com, there are 1.8 billion photos being uploaded on Facebook, Instagram, Flickr, Snapchat, and WhatsApp every day since 2014. So if famous pages, accounts, or websites—be it local or international—feature your work, it is definitely an achievement. The least I could do then is to return the favor by expressing my overflowing gratitude through this year-end blog post. Having said that, it will not end here. I am to enhance my composition skills; learn about correct exposure and using filters; and post process works via Adobe Photoshop are some of the many things that excite the philomath in me as we speak. A million thanks to It’s More Fun in Bicol, Bicol Bloggers, Philippine Images, (for the special mentions); Photobook Worldwide & Life in Saudi Arabia (for the features respectively); Almarai Company, Ace Galleta, & Sai Achanta (my travel sponsors this year); Renante Crisostomo & thechinitowanderer (my first international travel buddies; our Dubai Chronicles series are now in queue for publishing); Mabel Kwong (my virtual writing mentor), Ms. Wonderwall (my number 1 supporter) and all those who contributed to this yet another prolific year for “Stories of the Wandering Feet & Mind“. Cheers to more photos, blog posts, and travels in 2017! This post is my entry to Pinoy Travel Bloggers’ Blog Carnival hosted by Mervz of “Pinoy Adventurista”. Next Post Chronicles Of A Three-Day Trip to Dubai: The Airport! Simple digicam doesn’t fit you anymore, Dynamic Duo. A super cam is your better companion. Anyway, I raise my glass to more adventures and travel stories in 2017. LOL! Unfortunately, we are not really tech savvy, and that includes cameras. We don’t even have those high-tech tabs/smartphones that can take amazing photos. And we are not really adamant in carrying heavy and bulky DSLRs in the mountains. Wow! The super duo was in the house. 🙂 Niña and Jeremias! Thanks a lot for the compliment! Nahiya tuloy ako considering your background in photography. By the way, are you guys from Bicol? Thank you too for asseverating one of my wishes–which is to add more to the list of these little achievements! I’m sure you’ve already gone a long way when it comes to these things. Wishing you the same nevertheless! Ang ganda ng Bicol, ba’t wala ata feature ni Inang Mayon? Hi, Ms. Arlene. Salamat sa pagbisita and for complimenting my now new place, Bicol. Got no decent pictures of Mayon. Smartphone pa lang kasi ang meron ako nung time na napuntahan ko ang Lignon Hill. Happy New Year to you and your Family, Ms. Arlene! Happy 2017. Haven’t been to Bicol yet. It must be really nice to see Mayon in all its glory. I smiled throughout this post, Sony. Looking at all of these features, you are certainly making your mark in the realm of photography. Amateur photographer? It hardly sounds like it, and from what it seems you are definitely a step above that. Art is abstract, and there is no right or wrong way to photograph a shot. Some angles might give a more put-together composed shot, but sometimes that is not the case – sometimes it is just a matter of shooting and creating that shot however we want to. I cam emphatise with taking a lot of shots and then only using a few for the blog. That is me all the time, shooting from different angles with different settings on manual mode, and it is so hard for me to stop. Often I find that the more photos I have, the more I can work with in post-processing. Very sorry to hear that at first the article “A Tour To…” did not give you credit for your photos. Very lucky you stumbled upon it and all was set right in the end. You’ve worked hard with your photos and rightfully deserve the credit. Good on you for standing up for yourself and for your work. Thank you very much for the shout out, Sony. It really was unnecessary, but thank you so much for thinking of me. I don’t really know how I inspire you; I’m not a travel writer, I don’t use a DSLR or single-reflex camera and I’m really just another person who does a bit of other things outside of work. I am very humbled, and with all of your travels, you inspire me. Wishing you very well for the year for both work, loved ones, leisure and travels. You deserve it, my friend. That’s the thing I like about you, Mabel. You still this humble person who already has a lot to proud of. Let’s not get to the details because I have a lot to spill if ever. You probably have no idea by now how much engaging your posts are, but above all, you as a person. The biggest thing that I got to learn from you in 2015 is commitment. This year, you taught me to write from the heart. It is a work in progress but I’m determined to keep up. You don’t just write. You share your heart with us, Mabel, and it resonates across your global audience. I wish one day I could do it. By saying do it means even just close to how you do it. On a light note, I so agree with what you said there: “I cam emphatise with taking a lot of shots and then only using a few for the blog.” That makes the two of us like you said. And let’s not forget the importance of post-processing. I just realized just how much recycled photos I posted on IG this year. Those photos were from my first travel experiences yet they look like new. Technology is so helpful in this regard. Happy New Year again, Mabel, and it’d be the happiest day of my travel blogging career and one of the happiest days of my life if our paths cross someday. Cam emphatise is a cool word. I will be using it for sure. You are ever so kind, Sony. Know that, believe it. It is interesting to hear you say I taught your commitment, because that is something I felt alienated me in 2016 (I think you meant 2016, no…). But we’re always on different continuums and all of us can take away something from each other. It is amazing what we can do with photos today, and no shame in reworking photos from the rather distant past. Thank you for leading the way with your travel blogs, travel and above all, your drive to be the best you can be in all of professional, family and leisure life. p/s: I am sure we will meet one day. I feel it in my bones, and in my heart. Hellow, Fellow PTB Rox! I dropped by your post and did a little tour before this reply. Thank you for sharing the link and for the kind words! I would have not learned some nuggets of truth from your year-end post. Hopefully soon. Some experiences I dunno how to express it on writing. Hehe! I’ll try to work on it. 😊 thank you very much. Gorgeous images in each photograph, Sony. It’s been a long time since I’ve visited. Perhaps, 2017 will allow me more time. Hope your year is filled with joy, laughter, proseprity and more LOVE than your heart can hold. Hi, Issy. It’s been ages…I’m so happy to hear from you. Happy New Year to you too, and thank you very much for the compliment! All the best for you in 2017. It sure has been awhile. You’ve branched out into the BIG waters of photography … so well done. Much SUCCESS !!!! Here’s to a 2017 of more adventures and great photos! I have raised my glass to more adventures and great photos, Claire! Thank you and I wished the same for you. Hi, Ms. Katrina. I believe you won’t regret it if you do visit more of the Philippines’ best destinations this year. Thank you very much for dropping by and pitching something in there!